TRAVEL BLOG Would You Cross China's Glass-Bottomed Bridge? 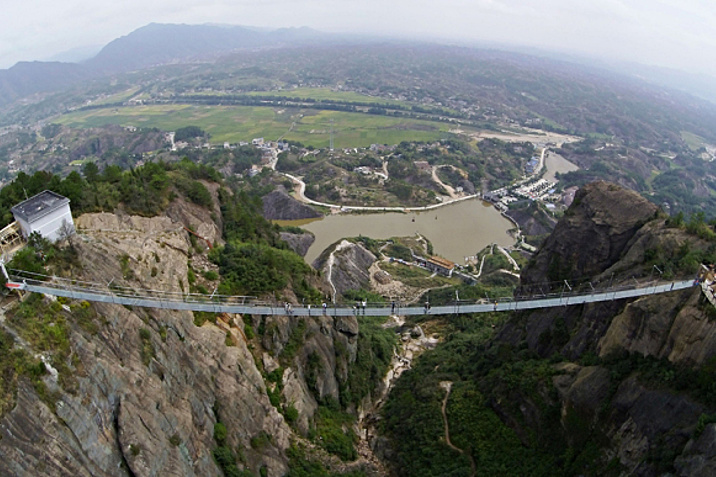 Would You Cross China's Glass-Bottomed Bridge? Known as the ‘brave men’s bridge’, the dizzying transparent walkway sits 180 metres above a valley in the Shiniuzhai National Geological Park in China’s Hunan province. Stretched 300 metres between two canyons, the bridge, which was frightening enough to cross when it was made of wood, was partly replaced with glass last autumn, before the whole bridge was rebuilt this year, entirely with glass. Now a journey across it is said to be terrifying, despite reassurances that it is entirely safe. The walkway’s 24-millimetre-thick glass panes are 25 times stronger than other forms of glass, allowing it to “stand firm even if tourists are jumping on it”, a worker who built the bridge told the China New Service. "The steel frame used to support and encase the glass bridge is also very strong and densely built, so even if glass is broken, travellers won't fall through," the worker added. The bridge was reported to be prone to swaying in the breeze when visitors first braved the journey across a portion of it last year, and trained staff were available to help anyone in need of emotional support to make the walk across. Later this year, the country is planning to open another glass bridge, designed by the architect Haim Dotan, across the Zhangjiajie Grand Canyon area in the Hunan province. Spanning 430 metres long and 300 metres high, it is set to be the world’s highest glass bridge once completed. The latest bridge is one of several vertigo-inducing attractions that have been unveiled recently in China and around the world. Earlier this year, a horseshoe-shaped glass walkway was opened to the public in the scenic Longgang region in southwest China's Chongqing Province, offering visitors views of a valley around 716 metres below. The path extends more than 26 metres off the edge of a clifftop. Last year, Zhangjiajie also built a cliff-side glass-bottomed pathway around 1,500 metres above sea level on the side of the Tianmen Mountain. The metre-wide and six-centimetre-thick glass skywalk was said to have been designed to “shatter, but not break” should a stone fall onto it from the mountain, according to a spokesperson for the local tourism board at the time. London opened its own glass walkway atop Tower Bridge last November, though the numbers don’t quite stack up against its Chinese rivals. Elsewhere in Europe, a glass-bottomed viewing box at 3,842 metres above sea level opened near Chamonix, France, in 2013. The five-sided cube juts out above the Chamonix Valley a kilometre below, offering a rather unsettling place to stand and enjoy views of the Mont Blanc Massif mountain range. Further afield, the glass-bottomed Glacier Skywalk was opened to the public last winter in the Jasper National Park of the Canadian Rockies while last summer, Russia unveiled the 439-metre-long SkyBridge, which stands 207 metres above the Krasnaya Polyana valley near Sochi. Described to be the “the world’s longest walkway” at the time, the footbridge includes two observation platforms, each offering panoramic views of the surrounding mountains and the Black Sea coast. Earlier this year, Caminito del Rey, dubbed as the world’s scariest footpath, was opened to the public for the first time in 14 years following a multimillion-dollar redevelopment over ten years. Spain’s three-kilometre-long cliff-side path, built 100 metres above the Desfiladero del los Gaitanes gorge, was closed in 2001 following five deaths in 1999 and 2000. The 110-year-old walkway, set in the village of El Chorro, north west of Malaga, has been fixed with a new wooden pathway and equipped with safety lines and steel bolts for visitors, who will be required to wear a helmet to walk across it. This article was written by Soo Kim from The Daily Telegraph and was legally licensed through the NewsCred publisher network. The Daily Telegraph is a daily morning UK English language broadsheet newspaper, published in London by Telegraph Media Group and distributed throughout the United Kingdom and internationally. Which Bali Beach is best for your Family?